(Clive, Iowa) January 28, 2019 – At the 2019 Iowa Pork Congress, the Iowa Pork Producers Association introduced the 2018 class of Master Pork Producers and Master Pork Partners. and their contribution to their community. There are six We Care principles that outline a pig farmer’s responsibilities to uphold high standards for animal care, food production, the environment, people, and community involvement. The 2018 Master Pork Producers and Master Pork Partners were honored at the 2019 Iowa Pork Congress. IPPA started the Master Pork Producer Award program in 1942 and has now named 1,484 Iowa pig farmers as Master Pork Producers. IPPA created the Master Pork Partner Award in 2014 to recognize pork production company employees who have made positive impacts on pork production systems, even though they don’t have active daily roles at a specific production site. , but have demonstrated positive impacts in their production systems and a commitment to the pork industry’s We Care ethical principles. All award winners are nominated by their peers and neighbors, and represent the diversity of Iowa’s pork production farms. This production diversity helps maintain the strength of the industry and enables Iowa producers to compete successfully in the domestic and international commodity and niche markets. The Iowa Pork Producers Association and Iowa State University Extension co-sponsor the Master Pork Producer program to demonstrate the character and breadth of Iowa pork production. 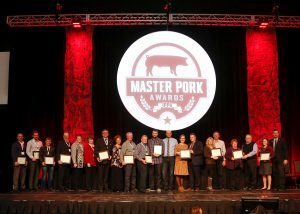 Nominations for the 2019 Master Pork Program awards will open in May.